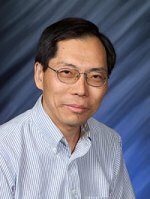 Lai-Sheng Wang, an Affiliate Chief Scientist at PNNL and a professor in the Department of Physics and Astronomy at Washington State University-Tri Cities, has been awarded a Guggenheim Fellowship for 2005. Lai-Sheng's ground-breaking research at Pacific Northwest National Laboratory involves surprising advances. He is a world leader in the field of nanoclusters. His research team, including WSU graduate students and post-doctorates, created the first all-metal aromatic molecule and discovered unexpected properties of extremely small particles of gold and boron. He also pioneered the study of multiply charged anions and created a research field of studying solution molecules in the gas phase. He has produced about 170 research papers in the last 13 years. Many of his papers appear in Nature, Science, the Physical Review Letters and the Proceedings Of The National Academy Of Sciences (USA), the top journals for his work. His work is also often carried by the CNN news, Materials Today and This Week In Science. In addition his work attracts a large number of citation by other researchers. The National Science Foundation has recognized his work by giving him a creativity award, and he has been elected a fellow of the American Physical Society. He was named a WSU Westinghouse Distinguished Professor in Materials Science and Engineering and an Alfred P. Sloan Research Fellow in 1996. The 2005 Fellowship winners include 186 artists, scholars, and scientists selected from over 3,000 applicants. Guggenheim Fellows are appointed on the basis of distinguished achievement in the past and exceptional promise for future accomplishment. What distinguishes the Guggenheim Fellowship program from all others is the wide range in interest, age, geography, and institution of those it selects as it considers applications in 79 different fields from the natural sciences to the creative arts. Scores of Nobel Laureates, Pulitzer and other prize winners appear on the roll of Fellows, which includes Ansel Adams, Aaron Copland, Langston Hughes, Henry Kissinger, Vladimir Nabokov, Isamu Noguchi, Linus Pauling, Paul Samuelson, Martha Graham, Philip Roth, Derek Walcott, James Watson, and Eudora Welty.